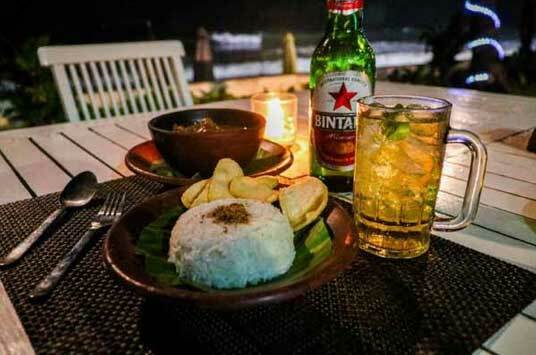 The island of Bali has enticed many expats to retirement overseas. And, for quite some time, the towns of Sanur, Legian, and Seminyak have been popular choices. But just up the coastline is Canggu and it’s quickly growing in popularity. Canggu, pronounced “changoo”, is a village located only 9 miles north of the more well-known party resort, Kuta. The western coastal stretch spans about 5 miles, running from Berawa beach to the village of Cemagi. It was once a hidden corner of the island, only known by a select few, but it’s now become one of Bali’s up-and-coming hotspots. Hinduism is the main religion across Bali and it’s no different here. There are many temples and shrines throughout the town, with the most famous of all found in the village of Cemagi. The coast strip is dotted with many lava stone temples, some of them centuries old and important to the Balinese culture. The Tanah Lot temple is honoured by the Balinese and holds special significance in Balinese history. Literally meaning “Temple of the Sea”, the revered temple sits on a large offshore rock formation and at high tide is surrounded by the ocean. The temple dates back to the 16th century and the main deity is Dewa Baruna, a sea god. The temple is one of seven sea temples around Bali, which are important in Balinese mythology. Driving into the region of Canggu evokes a country feel. The traffic thins, the crazed pace of the southern tourist areas is left behind and there’s a definite change to the urban sprawl. Fields of rice, banana plantations, and old-style warungs (small local eateries) line the roadsides. Local homes are dotted among the new villas and boutique hotels which are popping up. 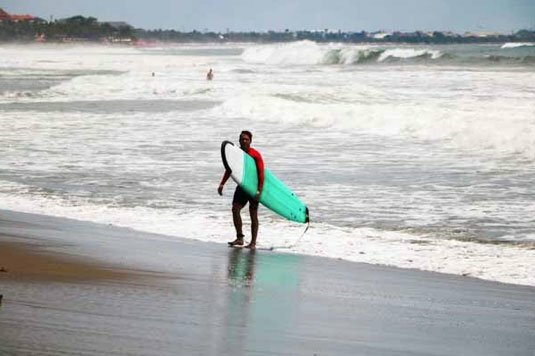 Despite the changing scenery, Canggu retains a surfing town feel, reminiscent of the northern Sydney beaches back in the day. While Canggu is known as the new hotspot in Bali, the population hovers around 40,000. Old-time Bali still exists and appears to be prospering, with locals, tourists and expats, a mix of old and new all merging well. During ceremony times, the temples are visited by the locals dressed in their traditional clothing. Tall bamboo poles decorated with color line the streets, and traffic comes to a standstill as blessings happen on the roads outside the locals’ homes. Away from the beaches though, you’ll find it is still very much a rural area. You’ll come across large blocks of land, covered with lush, green rice paddies, filled with colorful scarecrows keeping away the birds. Watch as the Balinese men and women tend to their gardens as white herons wander the muddy flats. There are three main villages that have thrived over the past few years: Berawa, Batu Balong, and Echo Beach. Ten years ago, a series of small villages were spread across these areas. They’ve since become lively pockets of shops, restaurants, cool cafés and bars, spas, and some amazing villas. There’s a buzz to the community and its popularity is increasing with both tourists and expats. There is real diversity to the area, with beach clubs spread out and the beanbag-on-the-beach bars with drinks piled high inside eskies on the sand. There are no beach sellers, other than the occasional ice creams and coconuts, so you can sit back and enjoy the sun without being approached by the hawkers that favor Legian and Kuta beaches. Expat surfers and swimmers enjoy the waters of the Indian Ocean and the locals join in among them. It may seem like a disjointed town. Buildings and river inlets mean you must drive around to each beach, if you’re travelling by car or bike. Known mainly to the locals, shortcuts do exist, but use them at your own peril. The shortcuts are virtually narrow paved paths, cutting across rice fields, paddocks, and villa properties. For a motorbike, it’s no issue, but for a car the width is barely wide enough. On the beach at Pereranan, you’ll find the huge statue of Gajah Mina. An elephant’s head with a fish’s body, it’s one of seven animals highlighted in Hindu mythology. It was built in 2016 by the local community and you’ll also see the same depiction painted or carved into the temples around Bali. The area is also famous for its large murals, seen on many walls as you make your way around the town. On one building, a 15-metre mural of a thinking woman is a standout. Sitting down, arms resting on her knees, she sits with her chin leaning on her hand, watching the world as it goes by. Surrounded by sprawling fields of grass and banana trees, it’s one of the most photographed murals. You’ll see many street-art murals around Canggu, most of them commissioned art pieces that wouldn’t be out of place in the streets of Berlin or New York. As a potential retirement location, Canggu offers a laidback lifestyle, close enough to the bigger town amenities without the hustle and bustle. The international airport is only a one-hour drive away and popular Seminyak only 15 minutes. A furnished villa, located in a quiet area and close to one of the beaches, can be rented from $780 a month. Some even come with rice-paddy views and you’re only minutes away from restaurants and cafés. Beach clubs, or large spaces calling themselves that, dot the community. There’s Finns Beach Club, Como Beach Club, and La Brisa, while Old Man’s has quickly become a favorite of expats. The bar scene doesn’t dominate this area, however, and Sunday is usually the only big day/night out. That’s not to say you won’t be able to socialize…there are plenty of restaurants and bars to enjoy a cold drink and a nice meal and meet with other expats at the same time. 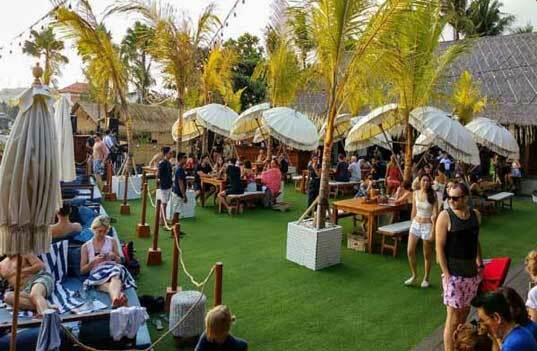 Echo Beach Club is a well-established icon in the Canggu area, and a favorite for expats and visitors alike. The seafood barbecue is a must, with seafood kebabs ($8), barramundi fillet ($6), or marinated pork ribs ($5) on the menu. A comfortable lifestyle is easy in Canggu, with Balinese traditions still prominent and modern conveniences at your fingertips. Enjoy a morning walk along the black sands or through the quiet streets as the locals come to life… a coffee at one of the many cafés or a long lunch at your favorite restaurant. Cooking at home is easily done and there are local markets which offer fresh fruit, vegetables, and produce. Around $10 will buy a week’s worth of vegetables and tropical fruits like pineapples, mangoes, dragon fruit, and mangosteens. At Nelayan Beach markets, a whole fish will set you back around $5 and a chicken, $4. Supermarket shopping is easily done, with both Popular Deli in Berawa and the Pepito supermarket in Canggu. $35 to $70 will certainly cover your needs on a weekly basis. For when you don’t want to cook, head out and discover the many places on offer. Healthy living is easy in Canggu. Try Quince for coconut crumpets in cinnamon butter, fresh strawberries, banana, and coconut flakes or avocado toast. Or you can get a huge mixed salad at Betelnut Café for $4. At Warung Dandelion, the gado-gado, a traditional Indonesian vegetable and satay dish, is only $1.70. Unlike destinations like Malaysia and Thailand, Bali isn’t known for its healthcare facilities. Dependant on the visa you choose, healthcare is available to expats choosing to live in Indonesia. For anything serious, most expats choose to travel to Singapore or Australia for treatment. For that reason, medical insurance is advised when living in Bali. Some expats who travel in and out often choose travel insurance to cover their needs. At about $350 for a couple per six months, it’s quite affordable. Siloam Hospital has a branch located in the center of Canggu and there are many medical centers available for minor ailments. A round of antibiotics and a consultation with a medical practitioner will only set you back around $11. Most over-the-counter medications can be purchased at the local pharmacy, known as the Apotek. For something as simple as paracetamol, a box of 100 tablets will cost around $3.50. For bigger hospitals, BIMC in Kuta and Siloam in Denpasar are most widely used. A 45-minute drive from Canggu, BIMC was the first hospital in Bali to be accredited by the Australian Council on Healthcare Standards International (ACHSI). Both hospitals have on-call specialists for any specific needs you may have. Relaxation in Canggu is taken to a whole new level. There are many studios offering yoga and Pilates and just as many spas for massages and indulgence. Go to Samadi Bali (a spa and wellness centre) for yoga ($9) and a Balinese massage ($17). The Canggu Studio will keep you fit, with Muay Thai, boxing, yoga, Cuban dancing, and salsa dancing just some of the choices. It’s easy to get around Canggu on a scooter, as the traffic here isn’t as chaotic as in other areas. You can easily lease a scooter for $40 to $60 a month or purchase a used scooter for about $280 to $550. Buying a car is just as expensive as back home, if not more so. But renting a car is easy. A Suzuki Swift is around $200 a month and usually you can negotiate that price for a longer term. For a quick getaway, head to Medewi. A two-hour drive from Canggu, Medewi is a remote village which offers a glimpse of Bali before mass tourism and Western ideals became established. The beach is part rocky and part white sand and local fisherman offer their daily catch at affordable prices. Also known for surfing and the sunsets, there are beachside bars to laze away the hours. Stay at the Sea Medewi Resort, situated on the ocean with picturesque sea view rooms ($50 per night). Canggu is a melting pot of differences all existing as one. Long known for its surf breaks, it was only a matter of time before the area was seen as a livable town in Bali. With a fantastic location, convenience, value for money, and local traditions, Canggu is a great area to consider for a relaxed lifestyle. Canggu is a relatively new expat haven in Bali compared to nearby hotspots like Seminyak and Kuta. It’s surrounded by pretty rice paddies and has rich, volcanic, black-sand beaches. It was first colonized by surfers who discovered the incredible waves which challenge even the most advanced riders and is now dotted with expat villas amongst the rice fields. It has also developed a trendy coffee shop culture where digital nomads hang out. For a quiet lifestyle, with dramatic views and plenty of amenities, Canggu is a great place to consider for a cool retirement destination. The real name for ‘Echo Beach’, which has only recently been named by the surfers who frequent it, is ‘Pantai Batu Mejan’ which refers to the Balinese temple there. The day my partner Andre and I went, it was very dramatic as there were huge king tides going on, with waves crashing right up onto the cliff top and under the tables in the cafes. It was a great photo opportunity and I couldn’t believe that there were actually a few intrepid surfers out there even in those rough seas. Even if you’re not a surfer, this is a chilled hangout for expansive sea views and panoramic sunsets. There is a row of seafood cafes where the aroma of grilled fish wafts along the cliff-top to greet you. Down a few steps you’ll find the black sand beach, which is truly photogenic, but not really ideal for sunbathing or swimming. At the far end of the beach is Sandbar, which is a relaxing place to sink into a beanbag or perch on the rocks out front to enjoy the ocean breezes. Whether you want interior design chic or a quiet place to contemplate, Canggu has an incredible range of places to get your caffeine fix. Try district (previously c’ugh house) if you want open rice paddy vistas and a quiet place to work, they have a co-working space upstairs with a good internet connection. As the sun goes down, this place gets even more magical. They do a delicious selection of healthy treats too. There are lots of places where you can dine in the middle of the rice paddies, even sitting on a beanbag. There are themed cafes galore from vintage nautical to Zen or even Hawaiian. The hippy vibe is strong in Canggu, but there is also high-end, retro-inspired design and a lot of really unique interiors. If you’re after healthy food, Canggu is the place to be, you could try a different type of smoothie every day of the year. The aroma of freshly baked bread and cakes is a massive temptation too with your Caffè latte. And if you’re a tea lover, try the Matcha Cafe which takes the uses of green tea to a whole new level. Green tea desserts and all kinds of innovative creations to try. Canggu is a popular place with families and the next three activities are great if you have children or the grandchildren are coming out for a holiday to visit you. Royal Sport Horse Bali is a lovely place to learn to ride for all ages and their horses are happy and well-cared for. You can go for rides on the beach or through the rice paddies or tour a Balinese village. They put on kids camps and birthday parties and there’s a great restaurant there too. Finns Club has something for everyone. It is a huge center, with a water park, multiple pools, trampolining, a gym and spa, a bowling alley, a tennis club, and a kids club. There is also a business center. It has several different bars and restaurants so you’re totally spoilt for choice. You can even get a Sunday roast if you are missing home cooking. There are a wide range of different membership options, from a simple day pass to a 10-year family membership and you can tailor your membership for the facilities you will use. On a long stretch of gorgeous white sand beach, Finns Beach Club, (not to be confused with the Recreation Club above which is inland), is actually two clubs: The Finns Beach Club and the VIP Beach Club. The former is more family orientated and is dominated by its 30-metre infinity pool and the expansive bamboo structure from which you can relax and watch the spectacular sunsets during the nightly happy hour. You can rent daybeds and chill all day and party all night. There is a restaurant and sushi bar and three other bars, a resident DJ and plenty of live music to enjoy. Next door, the more exclusive and more grown up VIP Club has a beach-side champagne bar, picnicking on the manicured lawns, luxury changing rooms, a rooftop bar, and high-class dining as well as another world-class beachside pool. For both clubs, you’ll pay an entry fee which gives you access to a day bed and other inclusions depending on which club and which level of entry you choose. All in all, a really fun place to visit.